The former east German city of Leipzig is home to a massive tramway system. Running mostly on street track, the system serves a large number of suburban towns surrounding the city. Leipzig has the largest railway station in Europe and most of the tram routes pass this fantastic building that now also houses a very modern shopping mall. A large fleet of Tatra trams were built up during the Communist era, but are now being replaced by low-floor cars. A number of low-floor trailers have been added to the fleet to run with the Tatras. Our filming starts at the railway station during the very busy early morning rush. We then move along to the busy Martin Luther Ring and Roßplattz stopping to film at Jahnallee Sportforum and Westplatz along the way. Augustusplatz and Grimmaischer Steinweg are our next locations before ending up back at the Hauptbahnhof for the evening rush. Plenty of action featuring old and new rolling stock for you to enjoy. Our next visit is to the industrial city of Halle, on the river Saale. Halle also has a large network of urban tram routes on metre gauge track. Like Leipzig most is street track , but new extensions are being built to serve new housing areas. We concentrate our filming on the Marktplatz and Riebeckplatz which is not far from the Hauptbahnhof . This smart fleet still contains some Tatra T4 trams, but these are being replaced by newer low-floor cars built by Bombardier. There are also a number of partly low-floor cars built by Duewag. 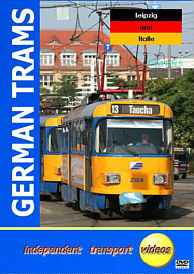 Since the reunification of Germany the former ‘east’ is now being modernised to improve the level of service provided. This video helps capture the current scene which, as you will see is steadily changing to the low-floor standard we are seeing all over Europe. Duration : 109 minutes (approx).